Since I did not get much of a chance to experience the religious gameplay of Civ6 in the Adventure One start, I decided to try one of the religious leaders in my next game. Out of the various leaders that have some ability related to faith, Saladin looked the most interesting to me. Arabia has the special ability of automatically getting the last Great Prophet if they haven't already generated one, which meant that I would be guaranteed a religion no matter what. Hopefully I would be able to found the first one, but you never know. Saladin's leader bonus provides very cheap worship buildings, at 90% off the normal cost (!) and also causes those buildings to produce bonus faith, science, and culture after researching Rifling tech. 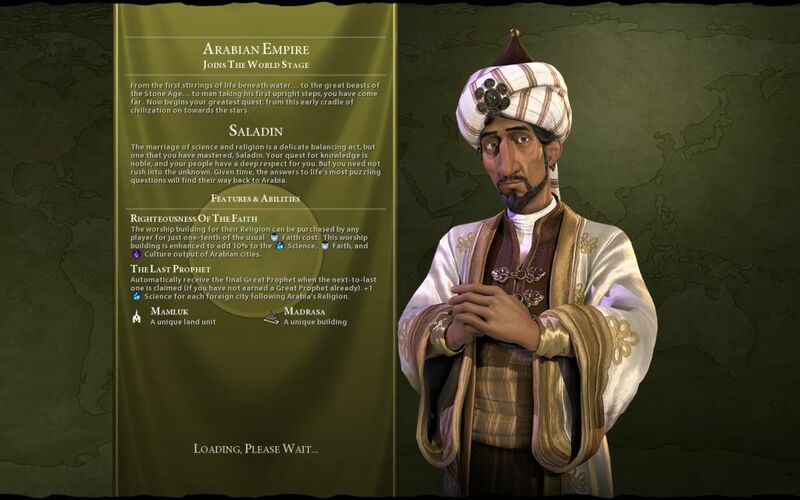 Arabia also gets the Madrasa for a unique building, a university replacement that provides extra science and extra faith, as well as appearing earlier on the civics tree than the standard university. All of that sounded more interesting for a religious game than anything the other leaders were offering, and so therefore Saladin it would be. I rolled a Small map and removed one AI opponent from the default number of five. I figured that a religious victory would be hard enough, and more opponents would only mean more of a need to micromanage missionaries and apostles. I also bumped the difficulty up to King for my second game, since there had been little challenge on Prince difficulty, even when I didn't know what I was doing. This would be a good test of putting to use some of the things that I had figured out in the Adventure One initial venture. Here was the start that I rolled. This looked to be a pretty good starting position, based on my limited knowledge of Civ6 thus far. I was on fresh water (a *VERY* big deal as I now know) with several hills in the immediate vicinity and four different bonus resources: stone, sheep, cows, and jade. This represented a nice mixture of food tiles and production tiles for Cairo to work. 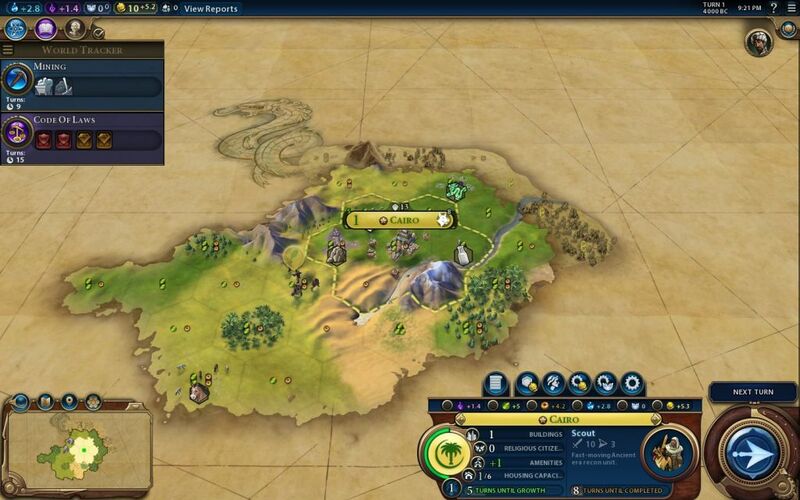 As I wrote in my Adventure One report, anything that adds production is extremely important in Civ6, and hills are the best normal way of getting production. This is the opposite of Civ4 where food is king (mostly thanks to Slavery civic). Here in Civ6, food is easy to get and production is scarce. A starting position that doesn't have fresh water to provide housing and hills to provide production is a crippled start. I opened by building a scout followed by a builder. As much as I would like to open with a builder, I don't see that as a very good choice unless barbarians are turned off. 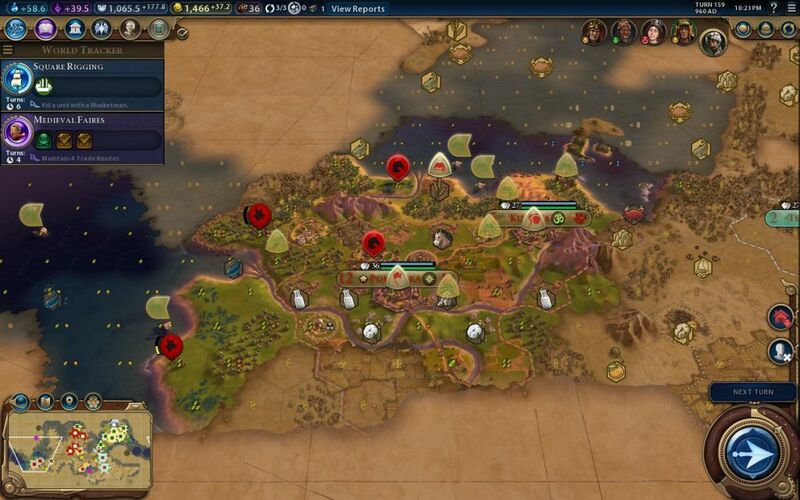 The initial warrior alone is not enough to keep barbarian spawns down, and scouts also do a nice job of meeting other civs / city states and providing some of the early game tech / civic boosts. Remember as well that there's no map trading in Civ6, and scouts do a good job of pushing back that sepia-toned emptiness. I quickly found that I was located at the northern end of the pangaea continent. There was one city state even further north than me, up in the tundra, and I had the good fortune to see it roll the religious type. 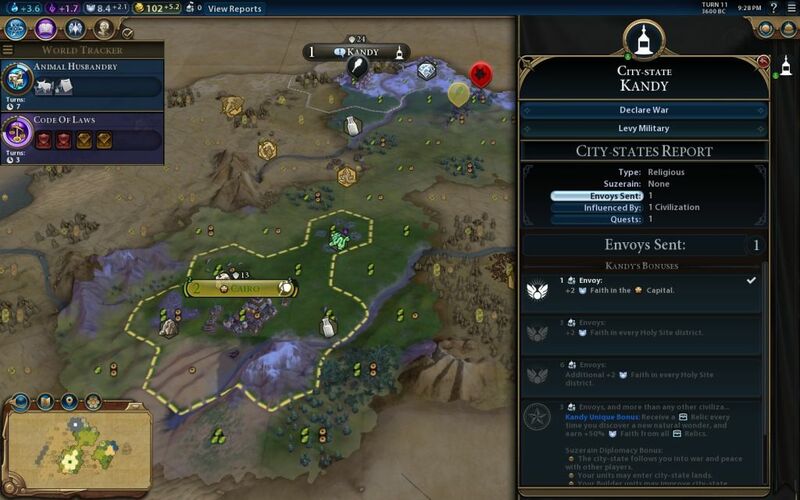 As the first civ to contact Kandy, I received an envoy for free, and that meant an immediately +2 faith/turn in my capital city. Perfect! I would be all but guaranteed the first pantheon, and then I could start accumulating faith towards... well, whatever it is you do with faith in Civ6. 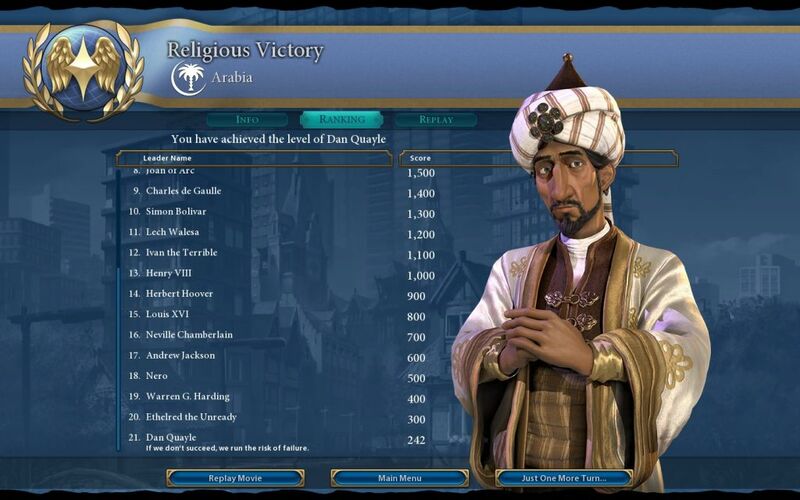 I mostly skipped the Civ5 expansions and didn't have much experience with how religion works in these games. In any case, befriending a religious city state seemed like a real break of good fortune here. I thought about what to take for a few long minutes before finally settling on Stone Circles. There was stone right at the starting position where my builder had already finished a quarry for an immediate 2 faith/turn. 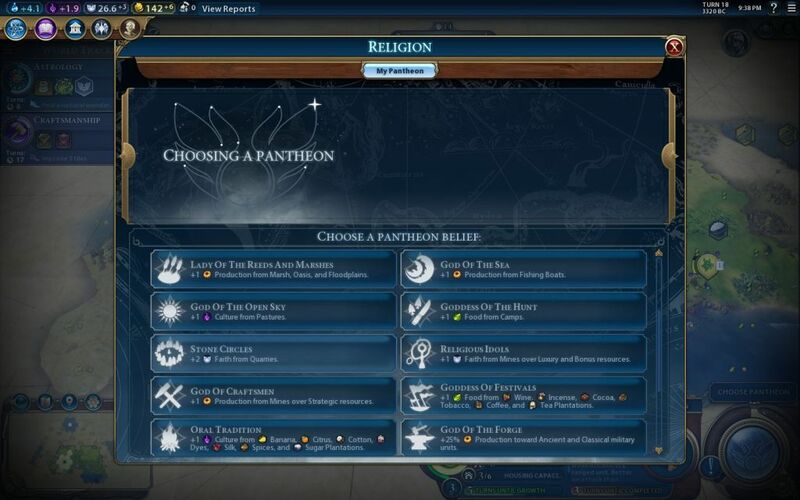 All of the other options seemed like they would take longer to get rolling, and I had the feeling that the faith-generating pantheon options would be swamped by Holy Site faith generation later in the game. Might as well get the biggest benefit up front immediately, here in the early game where it would be most useful. There were also several more stone resources off to the southwest that I hoped to settle later, so it's not as though I was stuck permanently with only a single tile improvement getting the benefit of this pantheon. Was this the best choice? I have no idea. Need more time with Civ6 to find out. I didn't see anything jumping out at me as being especially great for this start, and Stone Circles was a bit of a fallback choice. After training the initial scout and builder, I built a slinger to deal with the barbs wandering around, followed by a second builder. I had initially improved the stone and cows, and then had the great idea of using the third builder charge to clear the jungle on the tile between the two mountain peaks. That was where I was planning on building my first Holy Site district for the adjacency bonus, and by using a builder to clear the tile, I'd get free food and production that would otherwise go wasted. I moved the initial builder in there... only to discover that I couldn't clear the jungle yet, because I lacked Bronze Working tech. Ooops. Well, fortunately I could move to the forest next door and chop that tile, which went a long way towards completing the second builder. It was hardly a waste, as I would want to mine that tile anyway. I love the fact that tile improvements are back to having legitimate yields again, and chopping has returned as a thing. The fact that chopping scales at such a ridiculous rate, and you can chop for the full benefit anywhere on the map regardless of borders - those things are obviously overpowered and will likely be patched out in time. It's small things like this that make me generally positive about Civ6. Good mechanics with poor balancing can be fixed over time. Bad mechanics are largely unsolvable problems. 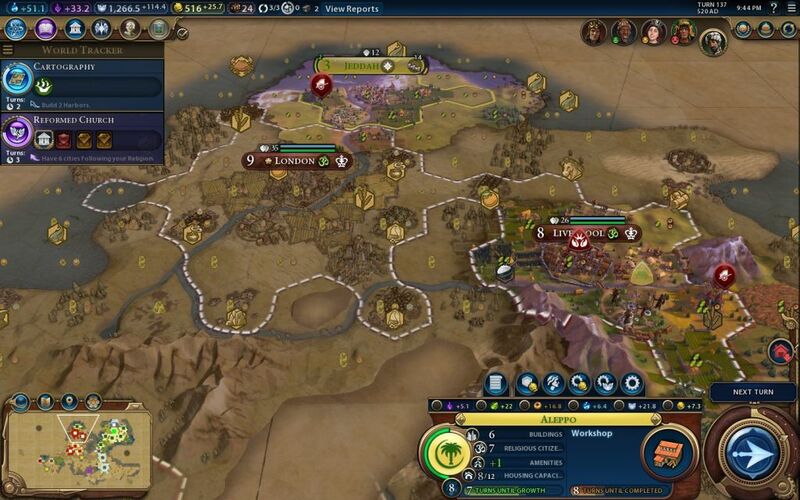 I was planning on founding one tile to the west, next to the mountains, but that stupid warrior from the city state won't move and blocks my path. (More fun with One Unit Per Tile. Sigh.) The warrior had been there for the last two turns, fortifying in place for whatever reason. And with barbarians on the prowl, I had no choice but to settle directly on this resource, which was a bit of a waste. At least I was able to use the tile to the west for a Holy Site later with a nice adjacency bonus. Aleppo would be the focus of heavy barbarian raids for centuries into the future. The barbs would come raging out of the fog to the west and attack across the river. Kandy provided a little help here and there, but not much. The barbarians also liked to raid through the hills just to the northwest of my capital, coming through that little pass in search of plunder. Have I mentioned there were a lot of barbarians in this game? Eventually I upgraded both slingers to archers and used them for the bulk of my defense. Thank goodness for those archers! The ranged units are just as overpowered here in Civ6 as they were in Civ5, and I racked up tons of experience for my two (eventually three) archers. I did catch a break in popping a trader unit from a goody hut, which allowed me to run a road between Cairo and Aleppo, for whatever tiny bonus to mobility that provided. I was also helped by the stupidity of the combat AI, which as usual tended to have the barb units shuffle around aimlessly without doing anything of importance. They could have pillaged me numerous times and failed to do so. I mean, thank goodness and all that, but it does make me wonder what these barbarian units are supposed to be doing. I'd rather have the barb spawn rate turned down, but the barbs that do show up focus on pillaging tile improvements and attacking cities. A horde of idiots is a lot less interesting from a gameplay perspective. I ended up founding Hinduism for no particular reason. 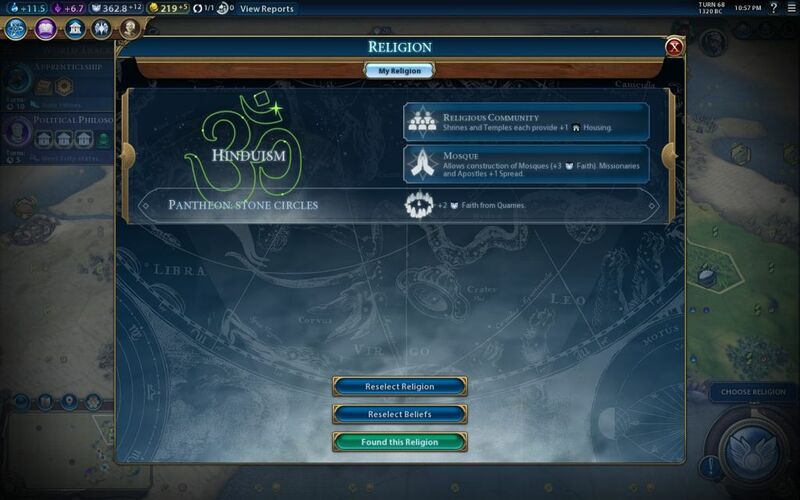 I do like the broad range of different religions presented as possible choices in Civ6, as well as some "blank" options that can be filled by whatever imaginary religion the player might invent. For my two religious policies (is that the right word? ), I chose Religious Community because my cities always seem to lack for housing, and I was building a shrine/temple combo at pretty much every city for the faith generation anyway. Might as well get two points of free housing in the process. And for a game pursuing a religious victory, the +1 spread for missionaries and apostles would be just about perfect, especially when combined with Saladin's incredibly cheap worship buildings. Those mosques cost all of 30 faith (!) to add in cities once I finished a temple. Worship buildings are supposed to cost 300 faith so... yeah, that was a little bit of a discount there. Here's a picture of my small empire at 1000 BC. Why does the 1000 BC date correspond to an oddball number like Turn 76? 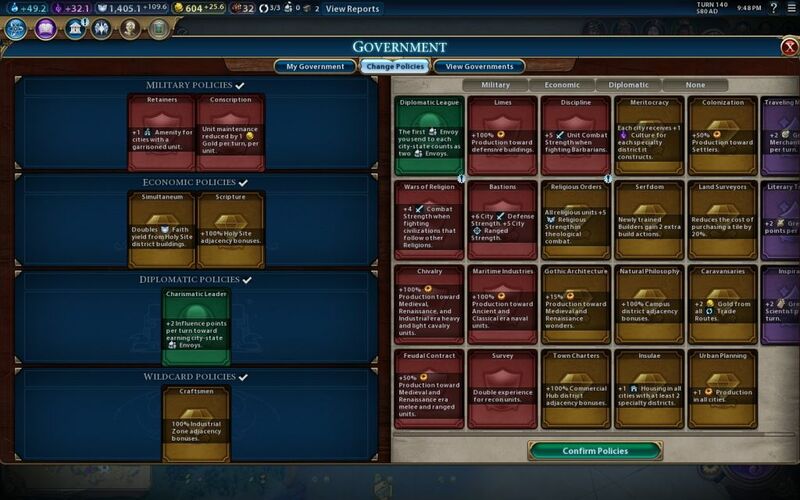 Apparently someone at Firaxis forgot that the starting turn in the Civilization games is supposed to be Turn 0, not Turn 1, and as a result all of the major turn numbers are no longer in sync with the round number dates. Obviously this doesn't matter, but it is sloppy. At this point I have finally turned the corner and won my long struggle with the barbarians. That camp on the west coast is about to be cleared by my archers, and afterwards I would spread those units out for fogbusting purposes in the wilderness. I would see one or two more barbs and that would be it. With the wilds finally receding into the dusty pages of history, I've been focusing on expanding, placing Hattin in the northeast and preparing another settler to head south, towards Montezuma. I simply could not expand down there earlier, too many barbarians. Research has finished Apprenticeship tech on this very turn to boost all of my mines and open up Industrial districts. That seems like one of the most crucial targets on the tech tree, along with Feudalism in the civics tree for the farm adjacency boost. 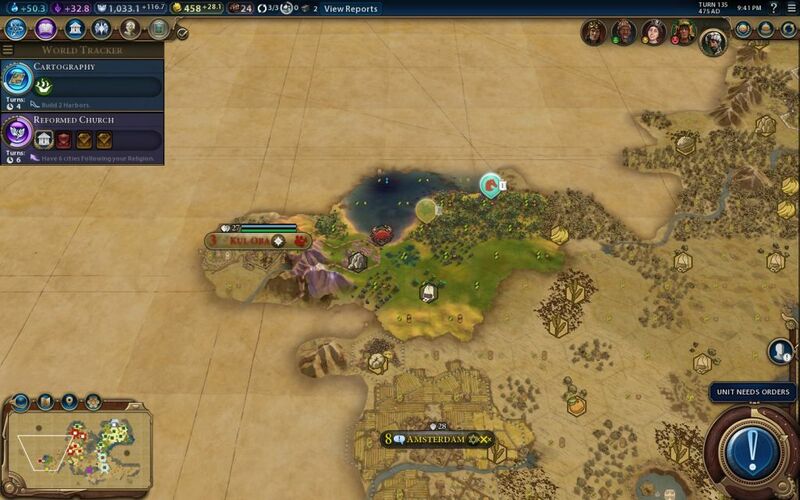 This is only my second game of Civ6 and I already find myself beelining these two targets pretty hard. I love the split tech/culture trees, but other players are absolutely correct when they say that both of them can be a bit dull. Way too many techs/civics with nothing but a new unit or a new policy. 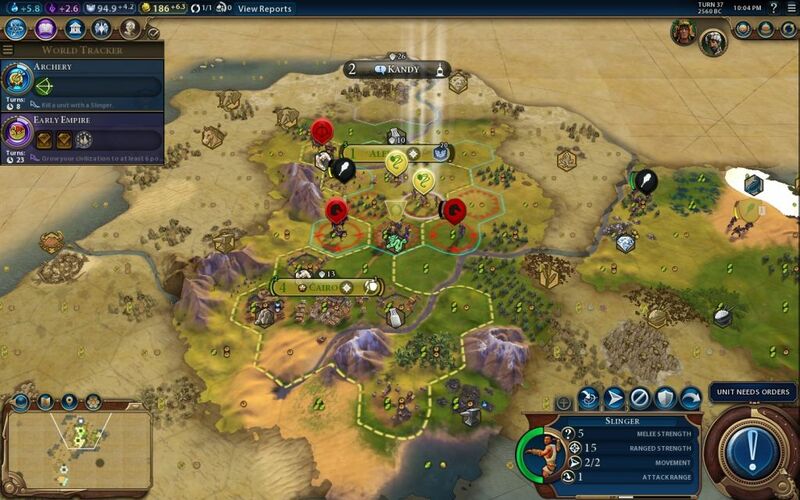 I hope this game will take inspiration from Civ4 and sprinkle some more interesting stuff in there down the road. How about some "first to research gets a Great Person / free tech" things to chase after? Or some policies that boost specific tile yields, like Universal Suffrage towns or State Property watermills? There's a lot of potential for more interesting stuff than what's on there right now. One other note: I have zero Campus districts, since any good spot for a Campus has been taken by a Holy Site in this particular game. This didn't affect tech progress as much as I expected, due to the fact that eurekas provide so many of the beakers for the early techs and Campuses and even libraries are fairly weak on their own. It's really when universities show up that the science districts start to take off, especially when boosted by the policies that double beakers from campus buildings. (Universities provide 5 science and that policy can double it to 10 science, which is the equivalent of a size 14 city.) But yeah, here in the early game, I was doing just fine with no science buildings whatsoever. This was amusing. 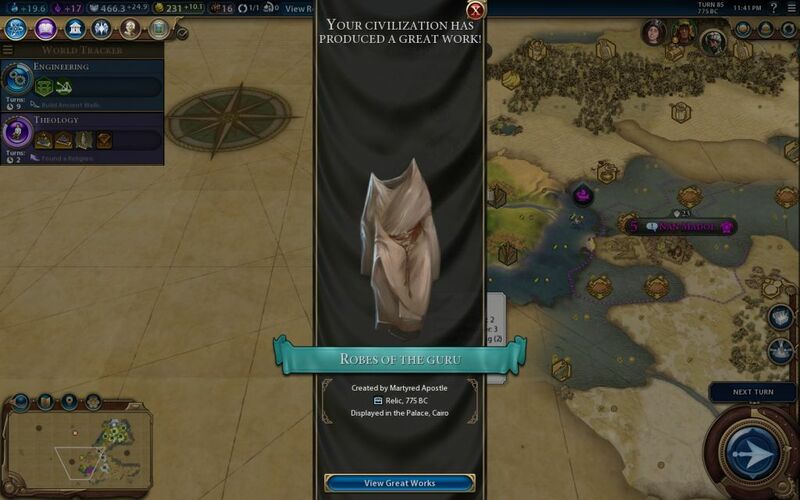 By becoming the suzerain of Kandy, I gained access to their unique city state benefit: any time that you discover a natural wonder, you receive a free relic. My scout stumbled upon a natural wonder in the southwest, and I magically received this set of robes from Kandy, which went into the palace for safekeeping. It produced more faith, which was fine with me. By the way, my scout somehow managed to miss the western entrance to the rest of the pangaea on this map, exploring the entire southeast corner behind Monty (which was a dead end) before finally backtracking all the way in the opposite direction. I still needed to find out who else was present in this game. It turned out that England and Kongo weren't that far off, but that still left one more AI hidden out there in the distance somewhere. This is the religious overlay. It displays the religious pressure of each different worship system in terms of a circle that fills up based on how many citizens are following the faith. I had converted my cities right away, and they were almost completely Hindu at this point. 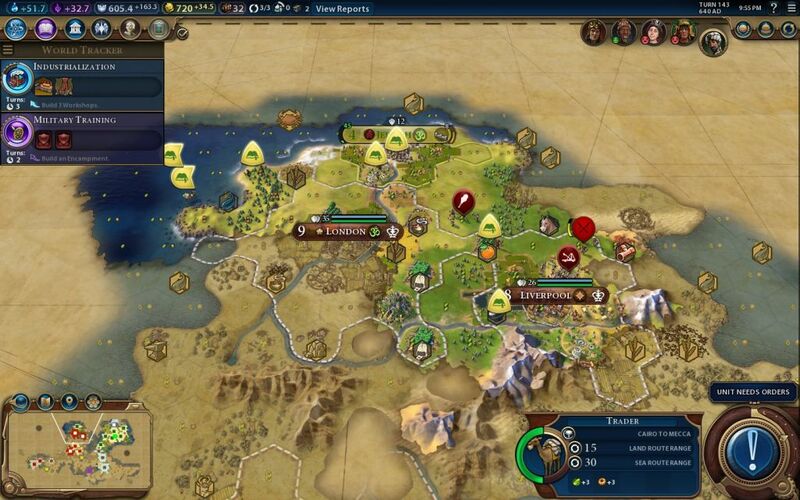 I had also converted Montezuma's two nearest cities at this point, and he had converted to Hinduism as well. What triggers the AI to adopt a religion is not quite clear to me. It seems like they will adopt a religion when more than half of their cities have been converted, something like that. Or maybe it's when more than half of their population has adopted a particular religion? I'm not sure. For the moment, my faith was unopposed as the only other religion in the game belonged to the mystery AI leader who I hadn't met yet. I also had the ability to create apostles now, and I used the first one to grab "evangelist" beliefs for Hinduism. 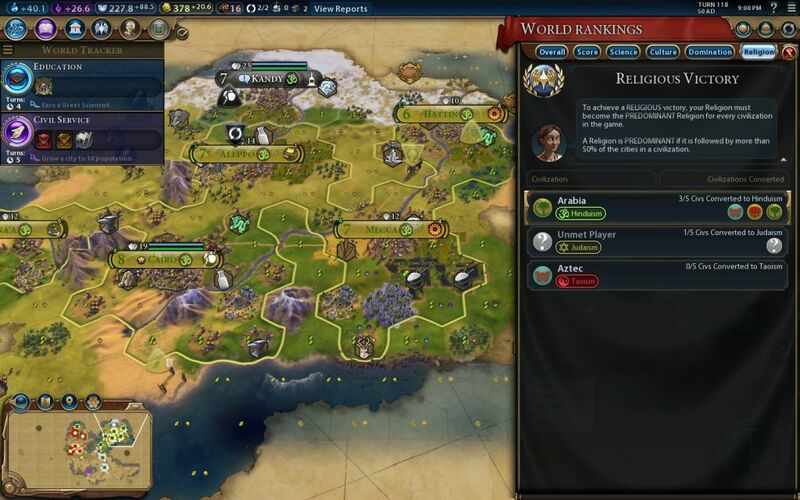 I took Scripture with my first choice, which causes religious pressure from nearby cities to be 25%/50% stronger and Tithes for +1 gold for every 4 followers of the religion. I don't know if these were particularly good choices, I was simply going off of gut instinct here in my second game. In restrospect, I would have been better served by Missionary Zeal (missionaries/apostles ignore movement costs of terrain) because my missionaries would end up spending a lot of time wandering through some rough lands looking for more AI cities to convert. Something to remember for the future. I don't think it's a good gameplay mechanic to have settlers be captureable. It's too big of a luck swing for no useful reason. 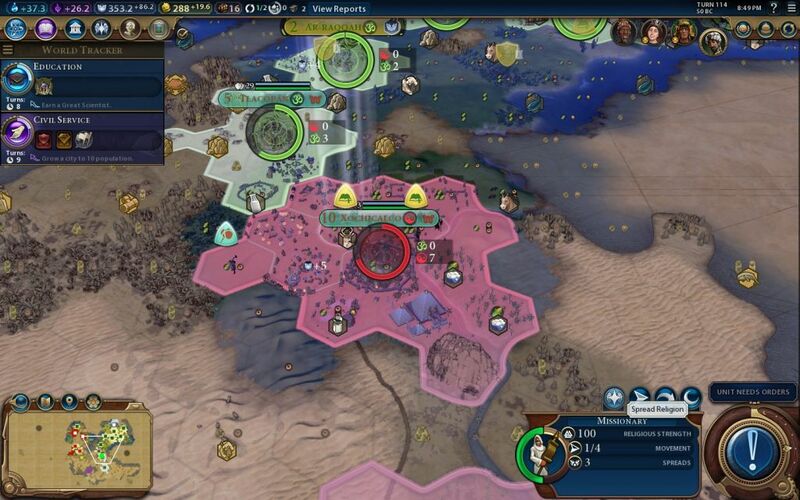 Even capturing workers in past Civ games was highly exploitable, with the whole "whack a city state for a free worker" in Civ5 being the most glaring example. I'd much rather see non-combat units disappear upon capture, with a gold bonus akin to clearing a barb camp going to the conqueror. However, that's not the current gameplay mechanic, so I took the settler for myself and plopped down a city right there north of Victoria. There were two forests to chop that I could use to produce most of a Holy Site district, and once I had that up and running, I could use faith to purchase missionaries right there next to English territory. That seemed like it would be highly useful, as the slow movement of missionaries across the map was my biggest obstacle at this point. I had plenty of faith for missionaries, I just needed to get them to their destination across hostile terrain. Xochicalco went from being almost entirely Hindu to almost entire Taoist. My former religious presence in the city simply disappeared without a trace, a bit silly if you ask me. I miss Civ4's ability to have one city found multiple religions. Anyway, now I had to start stamping out Montezuma's faith, which I was prepared to do with a flood of Hindu missionaries. The green and red colors of our religions battled it out in the deserts of Azteca over the following turns. 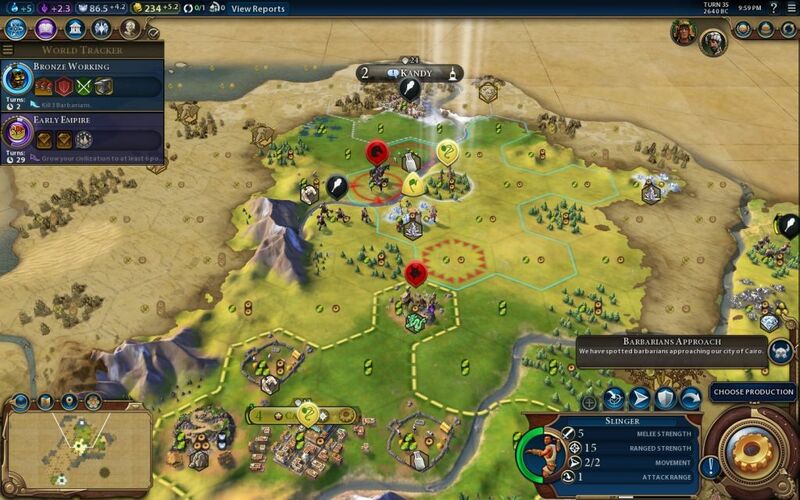 Of course, with my civ racking up almost 100 faith/turn compared to Monty's 12/turn, it wasn't much of a competition. I flooded him with missionaries and ignored his angry protests in diplomacy. Here's how the religious competition was shaping up. Montezuma had already converted back to Hinduism, but he had enough Taoist citizens that I was keeping the religious pressure on. I had also managed to convert the Kongo, and I had more missionaries slowly working their way over to England. Those two civs were both quite close to one another, and with no native faiths of their own, I was confident that I could keep them within the religious fold. Still one more civ to meet - where were they? At home, my cities were largely building Commercial and Industrial districts. 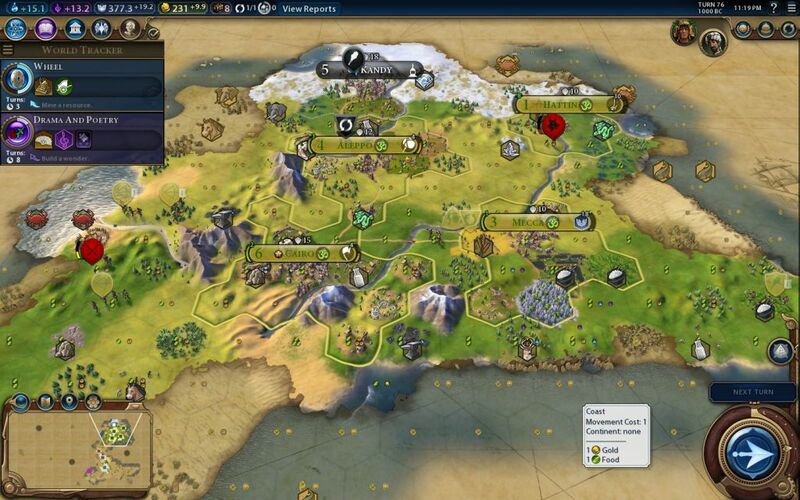 The three key districts seem to be those two and Campuses, together providing science/gold/production. The commercial districts would likely be skippable if they didn't open up trade routes, which then supply further food/gold/production. Build those three districts, a couple of theatre districts here and there, along with aqueducts/neighborhoods for housing and entertainment districts here and there for amenities, and you should be good to go. I'd also be expanding further, except that my immediate part of the map is largely full at this point. There was more territory available, but none of it on fresh water, and I could only see one spot that could even build an aqueduct via a mountain connection. No fresh water and no possibility of an aqueduct largely means a crippled city until later in the game when neighborhoods open up. Beyond that, I didn't expect this game to last that much longer, making far flung expansion projects unnecessary. I had enough faith generation to win the game already, it was just a matter of doing the execution with lots of missionary spam. Yeah, that's more like it. Saladin's religious foot was firmly planted atop Montezuma's backside. I have no idea what those little red house (?) symbols are supposed to mean next to Monty's cities. No matter how many missionary spreads I used, I could never reduce Taoism any lower than this in these cities. Perhaps that means you've reached the limit of what can be done with religion here, I don't know. The interface certainly isn't helpful in explaining what's going on. The Aztecs didn't like me very much for all but wiping out their native religion, but there didn't seem to be much they could do about it. Time to focus on spreading the faith to other targets. I finally found the last missing AI opponent: Tomyris of Scythia. She was the founder of Judaism, and about as far away as it was possible to get on this map from my starting position. I had a choice of walking through a very long stretch of jungles/mountains/rivers or embarking missionaries to travel via the seaways. That seemed like a better choice, and I resolved to start researching towards some of the naval techs which would allow my land units to cross ocean tiles. With no Campuses and no science buildings, that wasn't as fast as I would like, but it would have to do. There was still one more Great Prophet out there, and Victoria was guaranteed to get it since Mvemba of the Kongo can't found his own religion. Sure enough, eventually it popped up at Liverpool. The good news was that I already had my little colony of Jeddah up and running, which had slowly finished its own Holy Site district, followed by a cash-rushed shrine, which allowed me to produce missionaries out of this little iceball. Or at least it would shortly, as I needed Hinduism present in the city to be able to rush Hindu missionaries. I didn't know about that, and had to wait for a missionary to walk up to the north, taking about a half dozen more turns. He's passing by Liverpool in this screenshot, and was fortunate enough to get a glipse of the new religion's founder. I had banked well over 1000 faith at this point, however, which I would use for a flurry of missionaries out of Jeddah as soon as Hinduism appeared, and I expected that would allow me to deal with this little attempt from Victoria to break free of the religious cage I had constructed. I built the Hagia Sophia around this point in time, which combined with my various other bonuses had my missionaries and apostles getting four spreads apiece, double the standard number of two spreads. It was amusing to watch a pair of missionaries walk up next to a heathen city and spread the faith a combined eight times, for +1600 Hinduism points. There wasn't a lot the AI could do in response to that. When I was playing this game, I didn't even know that apostles are generated with random promotions, and that some of them are much better than others. It's too bad that the city state that allows you to choose apostle promotions (Yerevan) wasn't present in this game, although I didn't really need it. Here's a picture of my government after swapping into Theocracy. The main bonus is coming from the Simultaneum policy, which is doubling my faith output from Holy Site buildings, and let me tell you, I had a lot of those. Holy Site buildings were about all that I had constructed in this particular game. This quickly boosted faith up near the 200/turn mark. Theocracy government itself was also quite nice, providing a discount on faith purchases and allowing me to purchase military units with faith, not that I never needed them. The AI had been quite peaceful this game, with only the barbarians posing a threat. Well that didn't take long. I bombarded Liverpool with a flood of missionaries and strangled Protestantism in its cradle. Victoria protested and gave me a lot of hurt looks, but I didn't particularly care. She went back to practicing the Hindu faith and that was all that mattered. 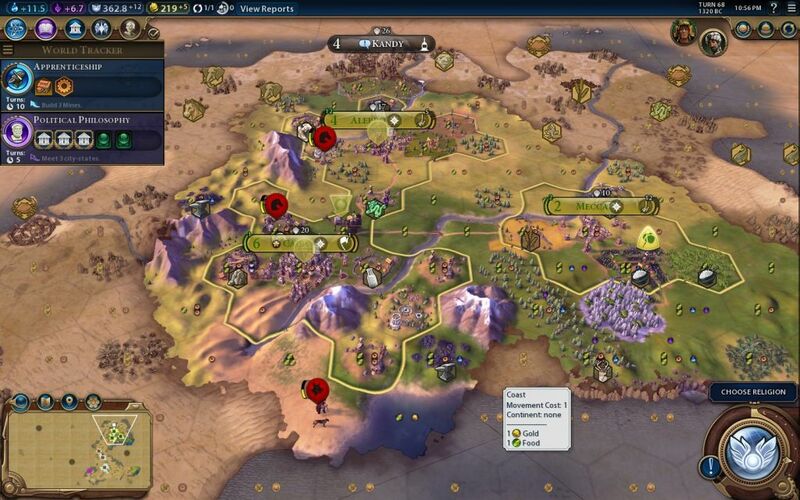 Only one more civ to go off in the west and this game would be finished. 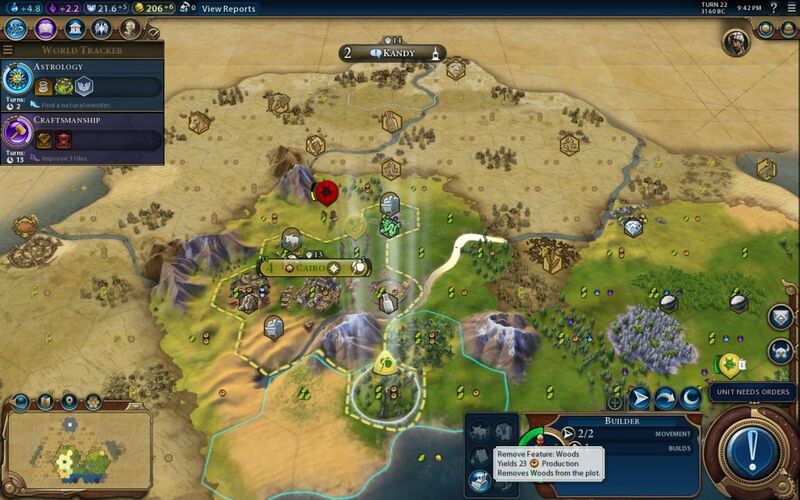 On that note, I had a series of missionaries heading off towards Scythia by the fastest route available. Given the hostile terrain over land and the extremely weak roads in Civ6, the fastest path appeared to be via the seas. That led to the comical sight of seven or eight missionaries all sailing in a line, off to go convert the steppe nomads of Tomyris. Go religious fleet, go! There were a number of barbarians prowling around on the coast, which made this an especially amusing journey. Fortunately there were no barbarian triremes to spoil my day, or this would have turned into one of those ill-fated crusades of the late medieval period. Eventually the missionaries reach Scythia and... what the heck, Tomyris! This fearsome warlord, with one of the most overpowered unique units in the game at time of writing, apparently couldn't even control her own territory against barbarians. I swear, the AI in this game is just terrible right now at release. 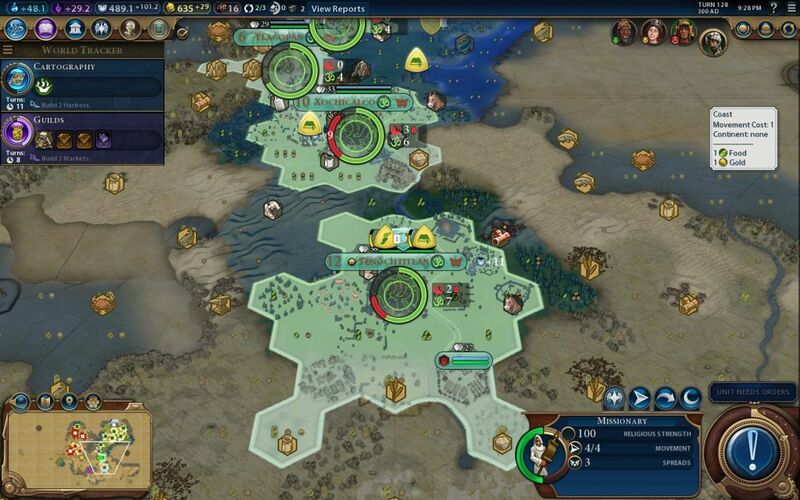 Firaxis, please fix your AI coding as soon as possible. When a King AI specifically designed to be good at warfare is getting pillaged in their core cities 150 turns into the game, something is very seriously wrong. Oh I did I mention that Tomyris only had three total cities? And none of the AIs went beyond four cities in this game? The AI right now is embarassing. 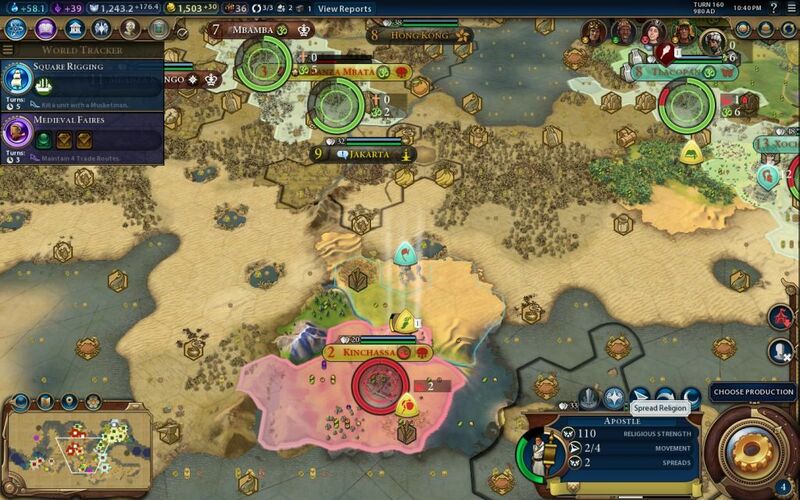 It also meant that my missionaries needed to dodge around barbarians while trying to convert Scythia. I realized almost immediately that those barb units weren't going to disappear any time soon, and I would have to land and take my chances of them not attacking if I wanted to end this game in short order. Fortunately, the barbarian horses were just as dumb as the Scythian units, and they mostly ignored my missionaries, killing one or two of them but leaving the rest alone. I had more than enough units here, I simply needed to survive long enough to get those religious conversion charges off. Meanwhile, Victoria had gone to war with Mvemba and captured one of his cities. That was enough to knock the Kongo out of Hinduism, as now Mvemba only had two cities and one of them was Taoist. 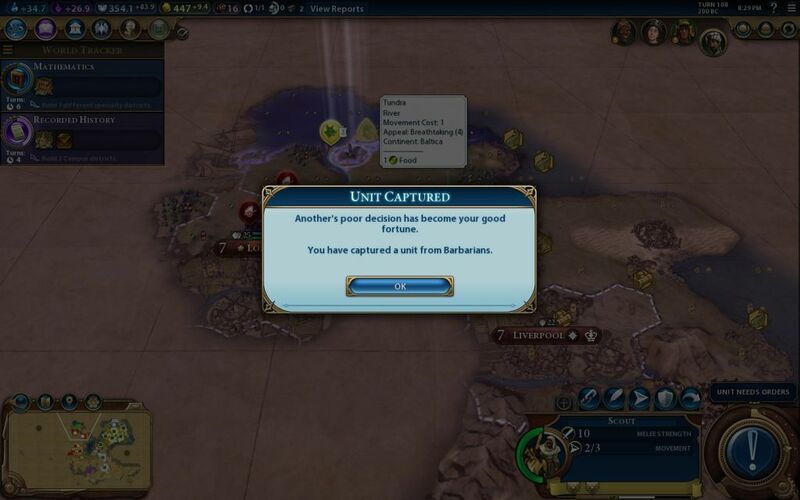 I had been checking the victory screen pretty frequently, and spotted this in time to send another missionary and apostle over by Aztec territory over to this city. 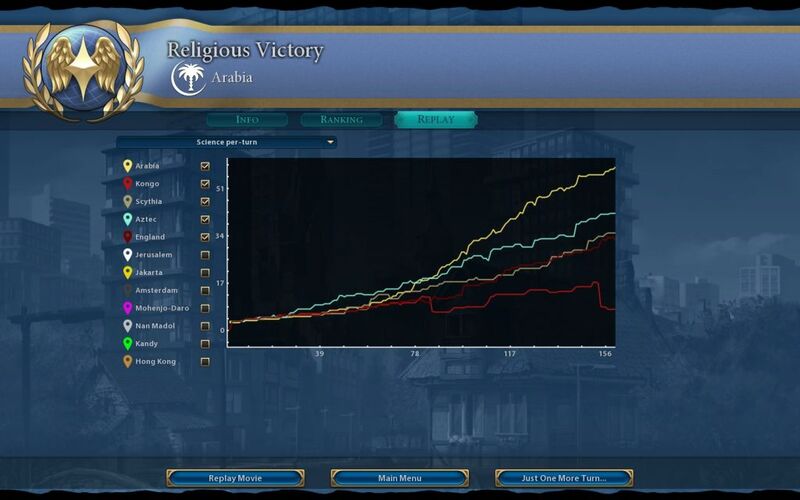 I spread religion here and, boom, instant Religious victory. What? The victory screen had not been showing Tomyris as having converted to Hinduism, nor did it show Mvemba as having converted. I guess that screen only updates at the beginning of each turn, not in real time (?) A little bit confusing, but whatever, we win! On the bar graphs I crushed everyone else in faith, which was not much of a surprise. What was more noteworthy was the science graph, where I still led in beaker output despite building zero Campus districts and no science buildings of any kind. That's kind of a problem there. While King difficulty isn't especially high, I would think that the AI would do at least a little bit better here, given that I made no effort at all in terms of science. 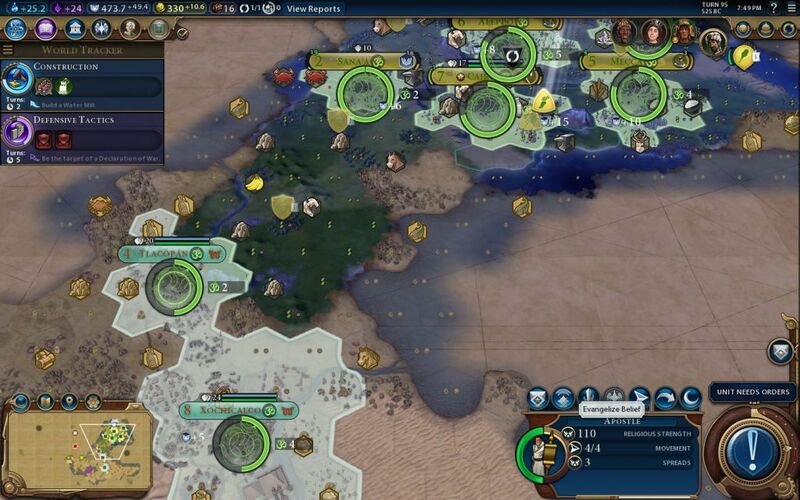 If the AI can't play the game any better than this, we're going to lose interest in Civ6 sooner rather than later, and that would be a huge shame because the city-building mechanics are outstanding in this game. We do need an opponent to play against, however, and the AI isn't getting the job done yet. Thanks again for reading. I still like this game a lot more than Civ5, and I plan to keep turning up the difficulty level in search of more worthy AI opponents. Stay tuned.